During clathrin-mediated endocytosis cells selectively internalize molecules from the plasma membrane and surrounding environment. This well-studied pathway allows cells to control the uptake of factors critical for cell growth and proliferation. Consequently, defects in clathrin-mediated endocytosis have been linked to a broad range of diseases such as Alzheimer’s disease, atherosclerosis, and cancer can result. Much has been learned about clathrin-mediated endocytosis using fluorescent-fusion proteins and live-cell microscopy to observe endocytotic events, which take place on a subcellular scale (~100 nm) and are highly transient (~30-60s). “Unfortunately, the inability to perform genome-editing in mammalian cells has required the use of plasmid-based transgene overexpression, which has brought long-standing concerns that an overabundance of tagged protein (at non-native levels), could perhaps perturb the cellular process under investigation,” said Dr. Aaron T. Cheng of the University of California, Berkeley. “Dr. Cheng and colleagues from the University of California Berkeley and Sangamo BioSciences Inc. took another look at clathrin-mediated endocytosis in mammalian cells by targeting transgenes expressing fluorescent proteins precisely to loci of endocytotic genes. They used zinc-finger nucleases to create gene fusions that maintain endogenous splicing and expression for live-cell imaging studies. The researchers, led by Dr. Jeffrey B. Doyon, used Imaris software, the most powerful and versatile 3D and 4D image visualization and analysis solution on the market for researchers in life sciences, to monitor the dynamics of endocytotic events in live mammalian cells. This included studies of a human skin melanoma cell line, in which zinc finger nuclease-mediated genome editing was used to express clathrin-RFP and dynamin-GFP from their respective genomic loci. The software’s particle tracking algorithms allowed them to identify and track events over time and provided information about particle lifetime, speed and intensity changes. 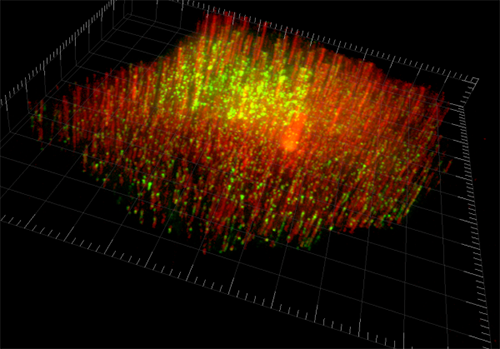 After performing background subtraction on total internal reflection fluorescence (TIRF) microscopy images of the cells, Imaris was used to automatically detect point-like particles with an estimated spot diameter of 500 nm (~5 pixels) and classify them as spot objects for further processing. Then, detected spots were filtered based on ‘intensity standard deviation’ and ‘quality’ control parameters, and only those with values higher than the set threshold values were considered for subsequent analyses. Quality was defined as the intensity at the center of the spot, Gaussian filtered by 3/4 of the spot radius. Figure 1: This skin melanoma cell (SK-MEL-2) was engineered using zinc finger nuclease-mediated genome editing for stable dual expression of clathrin-RFP and dynamin-GFP from their respective genomic loci. The x-y plane is the cell ventral plasma membrane, and the z-axis shows time. Image courtesy of Dr. Aaron T. Cheng, University of California, Berkeley. Objects were traced through consecutive frames of time data using a Brownian motion particle-tracking algorithm. The researchers used a gap-closing algorithm to link the beginnings and ends track segments, which let them obtain tracks that were interrupted by the temporary disappearance of particles. Only tracks that appeared and disappeared during the lifetime of the acquisition (that is, 181 frames, 6 min) were subjected to lifetime analyses. “We most appreciated the ease with which Imaris handled large amounts of data, the ability for the user to change detection/tracking parameters quickly, and for the user-friendly graphical interface that provided near real-time visualization of particle detection/tracking results,” said Dr. Cheng. From these analyses, the researchers were able to see that the genome-edited cells showed enhanced endocytotic function, dynamics and efficiency compared with previously studied cells, showing that clathrin-mediated endocytosis is very sensitive to the levels of its protein components. “From this work, we demonstrated that fluorescent tagging mediated by genome-editing provides a more faithful representation than plasmid-based overexpression for the monitoring of live-cell protein dynamics,” said Dr. Cheng. Research Paper: Rapid and efficient clathrin-mediated endocytosis revealed in genome-edited mammalian cells, Nature Cell Biology 13, 331–337 (2011) doi:10.1038/ncb2175. Author: Jeffrey B. Doyon and colleagues, University of California, Berkeley and Sangamo BioSciences Inc.